Oklahoma Farm Bureau Harvest Watch follows the journey of four Oklahoma farm and ranch families as they plant, manage and harvest crops from the Oklahoma soil. Oklahoma’s farm families work long hours to supply the world with food, fuel and fiber, and the families of OFB’s Harvest Watch will share their experience every step of the way. Brent and Myndi Bolen, along with their three girls, raise poultry, cattle and sheep on their 700-acre southeastern Oklahoma farm near Idabel. The Bolen family has eight poultry broiler houses that produce around 900,000 eight-pound chickens per year for Tyson Foods. The cattle operation consists of 200 brood cows that graze on the Bolen’s pastures. The Bolens girls, Bay, Anna and Autumn have approximately 40 ewes that produce show lambs. 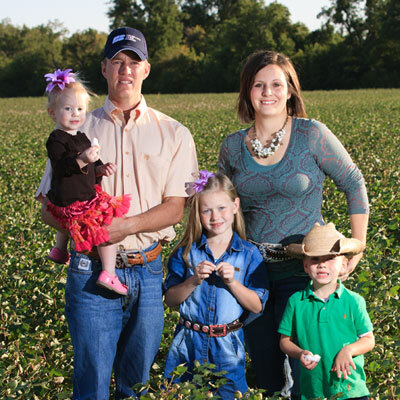 In their time off the farm, Myndi is also a CPA, and Brent serves as president of the Idabel School Board, Vice President of the McCurtain County Farm Bureau and on the Oklahoma Agriculture Diversification and Enhancement board. The girls stay busy with school, church, art, sports, band and sheep shows. 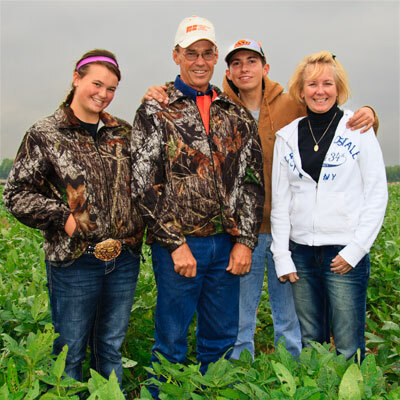 Kenny and Debby Fisher have a diversified crop and livestock farm near Bristow, OK. With assistance from their six children, produce a variety of crops including corn, soybeans and wheat. They have a small-scale vegetable farm where they grow sweet corn, asparagus, spinach, peppers, tomatoes and other popular vegetable crops. Many of these crops are grown in a certified organic business and marketed locally in nearby Tulsa. They also have a mixed-breed commercial cow herd and a feed store. In addition, their cousins operate a poultry business on the Fisher farm, producing cage free eggs for Whole Foods Grocers in Tulsa and other local markets. Matt and Lisa Graves are young farmers living and farming in Oklahoma’s panhandle, near the town of Gate. The Graves grow dryland wheat, milo and feed crops alongside irrigated wheat, corn and alfalfa. They raise 200 head of registered Angus cattle as well as raising stocker cattle. Matt and Lisa farm with Matt’s parents, who have been running Graves Farm for 35 years. The Graves have two young children, Xander and Keira. Wheat, corn and soybeans make of most of the grain production business on the Greg and Mary Leonard farm near Afton in northeast Oklahoma. Like many of our Oklahoma farm families today, the Leonards use high-tech precision agriculture methods, employing no-till practices to conserve energy and prevent soil erosion. Visitors will often see the Leonard’s two children helping with the farm chores. Greg is a nationally-known leader for Farm Bureau and the American Soybean Association. Mary is a school teacher and uses her job to help people better understand agriculture. Near the small western Oklahoma community of Canton you will find the Brandon and Cari Webb family farm. 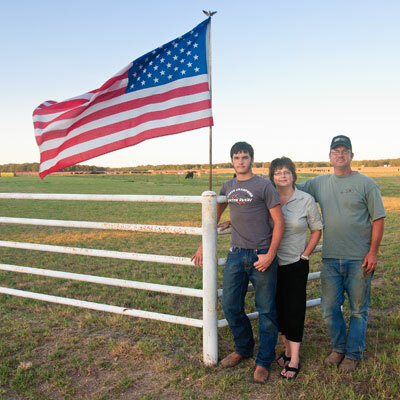 The Webbs, with help from their two sons, have a diversified crop and livestock business. They grow wheat, rye, grain sorghum and sesame. They also have a crossbred commercial cow herd. The Webbs use a variety of modern technologies on their farm, including solar-powered water wells. Although Cari grew up in the city, she has quickly adapted to farm life and can easily explain how food gets to the consumer’s table.